In what may be one of the cruelest but funniest work pranks, one construction worker was left running for the hills after his colleague dressed up as a bear to frighten him. 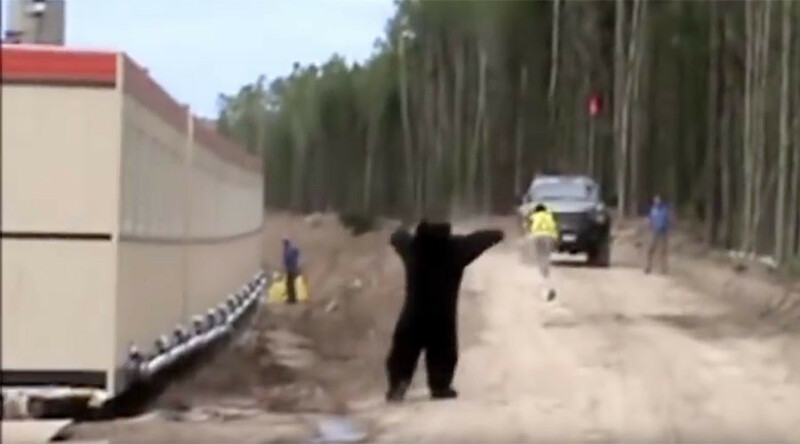 The expertly executed video clip shows a man wearing a hard hat and high vis jacket walking alongside a cabin, while unbeknown to him a fellow colleague waits just around the corner, dressed in a black bear costume. As the man turns the corner and comes face to face with the 'bear,' he drops his tools and runs for his dear life. As the prankster slowly crawls after him, trying to roar like a bear, the unsuspecting victim throws off his hard hat before tripping over himself with fear, as his other workmates look on and laugh. “Some say he's still running to this day,” joked another YouTube user.